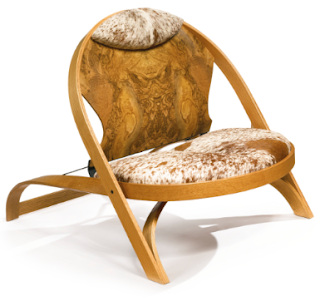 Richard Artschwager’s “Chair/Chair sold very well yesterday at Sotheby’s 20th Century Design Including Works by Tiffany Studios from the Geyer Family CollectionSale in New York. The designer, who passed away last month, spent three years on the design of this chair, which was inspired by a folding chair his family owned. In Cooper-Hewitt, National Design Museum’s Design is Not Art catalogue, Artschwager is stated as saying, his goal was to “make art that has no boundaries”. He believed it was up to each viewer to interpret his or her relationship to the work”. “If you sit on it, it’s a chair; if you walk around it and look at it, it’s a sculpture…’. I worked on this exhibition and as I recall his wife mentioned that it was their cat that sat on this chair in their house. Hmmm… art or design? Does it matter beyond how each viewer interprets it for themselves? I find it so beautiful as either art or design.